Last year saw the creation of the Lao Elephants, the first-ever Australian football club in the Lao PDR. The Phants, quickly famous worldwide for their distinctive pink and grey jumpers, impressed on the Asian footy circuit in 2008, putting in a strong showing at the Asian Championships and wining the Indochina Cup in Phnom Penh. The Lao Elephants currently have around thirty players on their list, including around twenty-five expats from Australia, the USA and Great Britain, plus four or five Lao nationals. However, the squad is spread across a wide geographical area, with about 18 hours worth of bus trip separating the Northerners in Vientiane and Luang Prabang from the Southerners, who are mainly Australians working at the mines in the town of Sepon. The first half of 2009 has seen a quiet patch for the Elephants as far as international touring is concerned, but in its place on May 23rd this year they held their first-ever domestic clash, with the Northerners traveling down the Mekong to take on the Southerners in the city of Savannakhet. 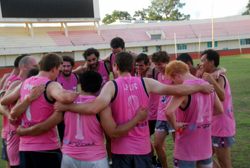 As new Lao Elephants coach Chris Sibree explains, "this was the inaugural hit-out between the Northerners and the Sepon mine guys, to get some match practice, get to know each other a bit more and have a beer. Also, a game we were planning against China fell through, so we are keen to get some game time before we play our next internationals." The match saw the Northern contingent too strong for the Sepon southerners, winning 11.10 (76) to Sepon 5.12 (42) - although at half time the Northerner's captain Santisouk Sengdara, one of the pioneering local Lao players in the team and also captain of the Lao Elephants in international matches, was heard to ask his charges in a stirring address; "Why you not kick to me, where is my umbrella?" Sibree explains that the matches between North and South are planned to continue in future, along with attempts to recruit more locals into the Elephants squad. "It was a great weekend, and there are more planned, just need to fit it in, particularly around the mining guys' schedules. It also raises the profile of Australian rules football - we had about 100 locals watching the match, somewhat bemused. The Savannaket stadium is a ripper though, paid for by the Australian mining company, with PVC piping posts!" "The Sepon mining contingent are having a few hit-outs down in Villaobuly, a place in the middle of nowhere near the mine, to have a laugh, get some practice and get motivated." "They also had one as an exhibtion game in conjunction with the Savannakhet Games, which are a big provincial aths competition, especially important given Laos is hosting the South East Asian Games in December 2009." "This was combined with an Auskick-style session and some general community bonding. The Phants are also partnering with Special Olympics Lao this year, and 50% of any money raised goes to them to support mentally disabled kids in sport. The rest of any money raised goes straight to paying for the local Lao guys making the internationals - flights, accomodation, etc - with all the expat Aussies covering their own costs. It's a pretty sustainable, healthy model." "On the game front, we're heading over to Hanoi 8 August for a hit-out against the Vietnam Swans, then Asian Championships in September, then the Indochina Champs in November, and we are desperate to have a home game to draw in some further sponsorship and promotion, hopefully with some involvement with Special Olympics Lao and the local ladies netball team." The Lao Elephants would also like to acknowledge their sponsors - Minerals and Metals Group Ltd, IndoChina Travel, Aman Hotel Luang Prabang and the Hive Bar Luang Prabang.